The Constituent Assembly (CA) has passed the constitution bill with two thirds majority on Wednesday. A total of 507 votes were cast in favor of the bill while 25 votes were cast against it. According to the interim constitution, two thirds majority is required to endorse the bill which means a total vote of 399 out of the 598 occupied seats in the CA would have sufficed to pass the bill. All three major parties i.e. 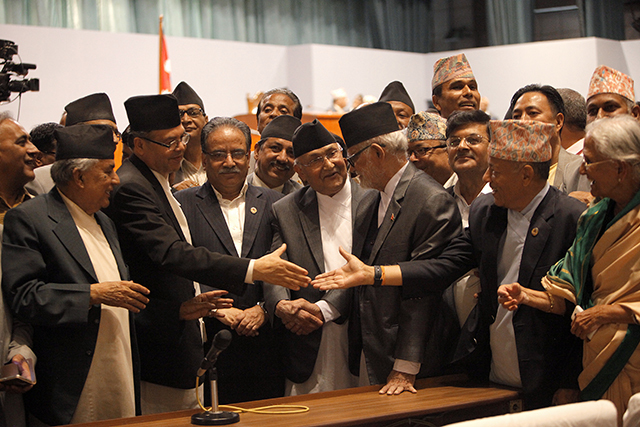 Nepali Congress (NC), CPN-UML and UCPN-Maoist along with a majority of fringe parties voted for the constitution bill. Rastriya Prajatantra Party-Nepal (RPP-N) led by Kamal Thapa however voted against the bill. Madhes-based parties had boycotted constitution drafting altogether. A committee led by Baburam Bhattarai will polish the language and order of the new constitution before five copies of the final version goes to print. The lawmakers will sign the five copies of Nepal’s Constitution-2072 on Friday and the CA Chair will authenticate the new constitution. The next meeting of the CA is scheduled for 5pm, 20 September when the new constitution will be promulgated by President Ram Baran Yadav. All the articles of the constitution were endorsed on Wednesday. A committee led by Baburam Bhattarai will polish the language. Is that the new jargon to change the constitution after it is passed. Nepal has got constitution that makes the news after a decade of baffling, bickering nd tiffs. But it is not the end to the trifles ahead as you might know that a constitution is only the framework within which a country makes the laws of the nation. As of today it is upto the populace of Nepal to send their right representatives to the parliament to amend those laws according to the needs of the nation respecting the democratic principles which are promulgated in advanced democracies. Thus it is upto the citizens to be the guardians of the said constitution so that social justice, liberty nd equality become the motto of every awaken Nepali.